Wet ground conditions due to a heavy overnight downpour forced abandonment of play on day one of the second and final Test between India and New Zealand here today. 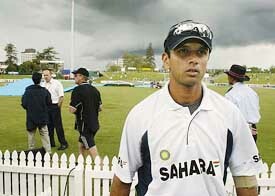 Indian cricket player Rahul Dravid leaves the pitch just before play was abandoned due to the rain on the first day of the second cricket Test against India at Westpac Park in Hamilton, New Zealand, on Thursday. The second Test is now effectively a four-day match after the entire first day’s play was abandoned because of rain. This gives the Indian team another day to regroup themselves but one thing is sure: whoever wins the toss, will decide to bowl first as the wicket will be more lively due to the rain. The decision of Indian selectors to withhold two names in the squad for the forthcoming one-day series against New Zealand has added avoidable pressure on at least Tinu Yohannan, if not on a couple of other fringe cricketers as well. The International Cricket Council today gave its final offer on contracts issue to the Indian cricket board, incorporating a series of concessions, and threatened it with penalties if it failed to ensure the participation of its best available team in the World Cup. Liverpool's Steven Gerrard (R) beats Aston Villa's Finnish goalkeeper Peter Enckelman to put Liverpool 3-1 up during their Worthington Cup quarter final match at Villa Park on Wednesday. Real Madrid's Brazilian star Ronaldo (L) and Roma's Brazilian Cafu fight for the ball during an exhibition match at Santiago Bernabeu stadium on Wednesday. Real Madrid play against Rest of the World team to celebrate its centenary. Jacques Kallis wrecked Pakistan’s hopes of a consolation victory by taking five wickets as South Africa won the final one-day international by 34 runs at Newlands yesterday. The day certainly did not belong to Punjab. Put in by Uttar Pradesh, the hosts did not have a happy outing while batting and barely managed to get past the 200-run mark thanks largely to the rescue act performed by tail-enders. A brilliant six- wicket haul by Amit Mishra overshadowed the knock of 85 by opener M.S. Dhoni as Bihar were all out for 225 on the first day of the four-day Ranji tie played at Nehru Stadium here today. Put in to bat first, Bihar did well to reach 100 without losing a wicket, in which other opener Nikhesh Rajan contributed just 14, taking 92 balls for the effort. Haryana entered the final of the All-India Cooch Behar Cricket Tournament by virtue of a massive 276-run first innings lead in their semifinal match against Orissa here today. Title holders Punjab will lock horns with formidable Bengal for the gold in the men’s football competition in the 32nd National Games at the Lal Bahadur Stadium here on December 21. Deepali Desphande of Maharashtra and Shweta Chaudhary of Haryana shot individual gold medals in the shooting event in the 32nd National Games at the shooting range in the Central University on the outskirts of the city today. Defending champions Manipur outclassed Andhra Pradesh 4-0 while Bengal prevailed over Orissa 3-1 to reach the women’s football final of the 32nd National Games here today. The Punjab quartet clinched the gold in the 60km road team time trial for men while Manipur women survived anxious moments before winning the 60km mass start team event gold in cycling events of the 32nd National Games here today. Veteran long distance runner Gulab Chand, who switched his allegiance from Uttar Pradesh to Andhra Pradesh, signed off the 32nd National Games with a superb triple gold medal haul here today. Veteran Wing Commodore I J Lamba of Haryana extended his gold streak bagging the one-day individual event, while Services picked up another gold in the team event as the equestrian discipline ended at the 32nd National Games here today. Haryana won the gold in the women’s roller skating hockey championship in the 32nd National Games here today. They were followed on the podium by Punjab, who won silver, while Chandigarh took the bronze. While defending champions Punjab & Sind Bank moved one step ahead to be in the final by defeating Railway XI Ferozpore 2-0 , Border Security Force defeated Punjab Police 2-1 in 6th Ramesh Chander Memorial Hockey Tournament being played at Olympian Surjit Memorial Hockey Stadium here today. Local favourites Indian Bank made costly errors and gifted their strong opponents Salgaocar, Goa, a 2-4 victory today, with Dudu Omagbemi notching up a hat-trick in the National Football League here. Mr B.S. Bodhi, who was working as District Sports Officer, Jalandhar, died yesterday following a massive heart attack. His untimely death was mourned by the officers of the Sports Department, Punjab, today. Not a single ball was bowled as the umpires — Asoka de Silva and Daryl Harper — who made three inspections of the ground, decided against risking the players on a waterlogged outfield and wet pitch. They called off the day’s play after making a final inspection in the afternoon. India are trailing the two-match series 0-1 after losing the first match by 10 wickets at Basin Reserve, Wellington last week. An hour each would be added to next four day’s play in order to compensate for the time lost and the Test will have a follow-on margin of 150 runs instead of the 200 that would have applied to a five-day match. Under the conditions, batsmen of either side will be tested by fast bowlers. I am not saying it is advantage New Zealand, because in case India get a chance to bowl first, who knows our seamers may just run through the fragile New Zealand batting line up. It is not impossible, but our seamers will have to bowl their heart out to make it happen. Other than the Test, focus will be on India’s World Cup probables list, and though I was surprised to find Ajay Ratra’s name missing from the 30, the selection was more or less on the expected lines. As far as the one-day team for New Zealand series is concerned, I am not too surprised to see the return of Yuvraj Singh, Anil Kumble and Javagal Srinath in the side. However, I am surprised to see that Murali Kartik is going to return from New Zealand since he was been dropped from the one-day side. Now, all those who had been saying India doesn’t have a left-arm spinner will see why. He had done well in the one-dayers against the West Indies, on the basis of which he was selected for the Tests in New Zealand. But now, he is back to square one, not having played a Test or ODI there. I also pity Yuvraj Singh. By the time he lands in New Zealand, he will have just a couple of days to acclimatise himself with the conditions. It is never easy for a batsmen, or even bowlers to fly straight into a series with expectations of him sky high. At the first place, Yuvraj should have been kept with the Test side because he needs to train and practice with the team, with the World Cup approaching. 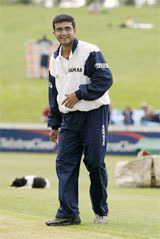 Srinath, of course is back in the side owing to the inability of Ajit Agarkar and Ashish Nehra to make an impression. This does not augur too well of the future. The selectors announced a 14-member squad for the one-day series which has three fresh inclusions in Javagal Srinath, Anil Kumble and Yuvraj Singh besides the 16 who are doing Test duty. If the other two players to be named are also new faces, then at least five from the present bunch would be returning to India. It would not take long for anyone to figure out the five cricketers who are home-bound - Shiv Sunder Das, Ajay Ratra, Ashish Nehra, Tinu Yohannan and Murali Kartik. The last two players could still stay back for the seven-match one-day series but it is a hit-and-miss kind of situation. Selectors have been unfair to Yohannan, if not to Ratra and Kartik. Yohannan has been praised by both captain Saurav Ganguly and coach John Wright for the way he has become a better bowler since the England tour in summer. After spending a year in wildnerness, he finally got a chance to show his skills in a Test again though the weather at Hamilton has put his ambition on hold. Kartik was declared to be the bowler of the series against West Indies by the rival captain Carl Hooper. The left-arm spinner was included as Kumble took a break after two games. Kartik took four wickets from four games, his victims including the likes of Ramnaresh Sarwan, Chris Gayle and Marlon Samuels. It would be fair to say Kartik did not let the absence of Kumble be felt. Not only Kartik has not played a game on the present tour, there is also a possibility he might be on plane back home. Though Kartik has been included in the provisional list of 30 for the World Cup, it would not have done much good to the confidence of a spinner who was such a force for India ‘A’ in South Africa earlier this year. Kartik was the bowler of the series on those very wickets where the World Cup is scheduled — his victims included men like Jacques Rudolph — rated to be the next Graeme Pollock in South Africa and the experienced Hilton Ackermann. The case of Ajay Ratra has been most offending. The young Haryana wicketkeeper became only the first Indian wicketkeeper to score a Test century abroad when he managed an unbeaten 115 against the West Indies in Antigua this summer. But after just two Tests, he was sidelined in favour of Parthiv Patel. He was given a chance at the Oval partly because Patel was injured and also because he had struck an unbeaten hundred against Derbyshire. Yet the likeable youngster has not even been included in the provisional list of 30 for the World Cup even though a Deep Dasgupta can still nurture hope despite his non-too- impressive performance behind the stumps. Brijesh Patel, chairman of selectors, did the right thing by calling up Ganguly and John Wright before the squad was announced on Wednesday. He also called up vice-captain Rahul Dravid though it is only the captain and coach who are consulted. Be that as it may, all the three names forwarded by the Indian team management — Srinath, Kumble and Yuvraj have been included in the 14-member squad. The concessions include a 25-day reduction in the period after an ICC tournament for which the ambush marketing clause would be applied. Under the original clause, the players were barred from endorsing products which were in a conflict of interest to the official sponsors of the tournament for a period of 30 days before the event, during the event and 30 days after it. But the clause would now be valid only for five days after the event, the ICC said in a statement. The validity period of the image clause, under which the official sponsors were allowed to use player images till six months after an ICC event, has also been reduced to three months. Some more unspecified restrictions have been imposed on the use of player images by ICC sponsors in order “to avoid any suggestion of a personal endorsement by the players”. In making its offer, the ICC World Cup Contracts Committee (WCCC) emphasised that the BCCI remained obligated to both participate in the ICC Cricket World Cup 2003 and to send its best team to the event, the statement said. ICC president Malcolm Gray said the WCCC had also advised the BCCI that if it fails to meet its commitments it will face the potential of large compensation claims being made against it. “It is impossible to quantify the level of claims before the event but it is clear that if the BCCI does not meet its obligations and there are damage claims made as a result, the BCCI faces the potential of these claims being made against it for not delivering on its contract,” Gray was quoted as saying in the statement. The ICC rejected the BCCI’s request for a seven-day extension to the December 31 deadline for naming its final 15 players for the World Cup and stressed that the “deadlines in place on the BCCI are exactly the same as for all other boards”. It also withdrew a few India-specific concessions in the contracts clause, offered as a last-ditch effort to accomodate the BCCI’s objections, since the Indian board was not interested in those. Kallis ended a century stand between Inzamam-ul Haq and Younis Khan, which had put Pakistan in a strong position, then cleaned up the tail as South Africa won the five-match series 4-1. Inzamam (63) and Younis Khan (72) took Pakistan to within striking distance of a target of 266 and were scoring freely when Inzamam was fifth man out with the total on 189 in the 40th over. The pair put on 108 off 123 balls. Inzamam pulled a short ball from Kallis to man of the series, South African captain Shaun Pollock, who held a sharp catch at midwicket. 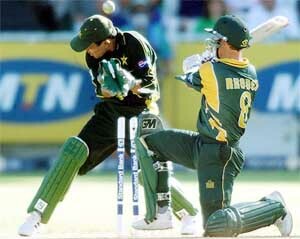 Kallis followed up by having Abdur Razzaq caught behind. Pakistan’s hopes plummeted when Younis Khan was run out and Kallis struck twice more as Pakistan lost their last six wickets for 42 runs. Kallis had figures of five for 41. South Africa’s total was set up by a 134-run partnership between Boeta Dippenaar and Jonty Rhodes after the home side recovered from a poor start. With Mark Boucher contributing a quickfire 34 off 16 balls, South Africa made 265 for eight after they had been struggling at 61 for three. Dippenaar hit a career-best 93 before he was caught in the deep in the penultimate over, while Rhodes made 81. Kallis skied a catch off Saqlain as South Africa struggled to get their innings on track after winning the toss and batting on a good pitch. But Dippenaar and Rhodes batted solidly as they added 134 off 163 balls. Dippenaar made his runs off 126 balls and hit seven fours, while Rhodes faced 95 deliveries and hit eight boundaries. Boucher slammed four sixes in his brief innings, two in an over from leg-spinner Shahid Afridi and two more in the next over from off-spinner Saqlain. Fall of wickets: 1-0, 2-22, 3-61, 4-195, 5-212, 6-258, 7-262, 8-262. Bowling: Waqar 10-2-41-4, Sami 10-1-46-0, Razzaq 10-1-32-0, Saqlain 10-0-68-4, Afridi 10-0-69-0. Fall of wickets: 1-1, 2-2, 3-42, 4-81, 5-189, 6-201, 7-204, 8-224, 9-229. The day certainly did not belong to Punjab. Put in by Uttar Pradesh, the hosts did not have a happy outing while batting and barely managed to get past the 200-run mark thanks largely to the rescue act performed by tail-enders. While bowling, the hosts were denied any breakthrough towards the fag end of the day as Uttar Pradesh, in pursuit of Punjab’s first innings score of 208, were happily placed at 39 without loss in the Ranji Trophy elite group “B” match at the Punjab Cricket Association Stadium at SAS Nagar, near here, today. The seasoned paceman Aashish Winston Zaidi hurtled the hosts towards doom claiming a well-deserved five-wicket haul. Punjab skipper Dinesh Mongia, among the probables for the forthcoming World Cup and so desperate to have a good outing out there in the middle, did no good to his cause and was run out for five. Reetinder Sodhi, another World Cup probable from Punjab, failed to capitalise on an impressive start and was out at 42. Zaidi deserves credit for putting Uttar Pradesh in the situation they are in. Bowling a disciplined spell he exploited the early morning conditions well making Punjab batsmen commit errors. He struck in the first over itself having opener Samrat Sharma caught behind the stumps. Zaidi struck again in his next over consuming left-handed Ankur Kakkar. Mongia scratched around for a while before being run out to leave the team at 15 for three. Zaidi further jolted the innings snapping up Pankaj Dharmani, the mainstay of the batting, as the hosts were reeling at 21 for four at this stage. Opener Ravneet Ricky and Sodhi combined at this stage and added 91 runs to the total to give a semblance of respectability to the Punjab innings before the latter was trapped lbw by wily Zaidi. Pacer Mritunjay Tripathi struck at this stage sending back Ricky to put the hosts in the hole again. Ricky made 45, the highest score of the innings. Allrounder Amit Uniyal showcased his batting abilities and contributed a vital 44 runs to ensure the team was not bundled out for less than 200 runs. The rival openers Rohit Prakash and Jyoti Yadav were circumspect and cautious enough and negotiated 12.1 overs in the fading light to deny the hosts any success. At draw of stumps Rohit, who grew in confidence as the innings progressed, was unbeaten on 28. Punjab (1st innings): Samrat Sharma c Anwar b Zaidi 0, Ravneet Ricky c Parvinder b Tripathi 45, Ankur Kakkar c Prakash b Zaidi 0, Dinesh Mongia run out 5, Pankaj Dharmani c Anwar b Zaidi 4, Reetinder Sodhi lbw Zaidi 42, Manish Sharma c Chopra b Zaidi 18, Amit Uniyal c Chopra b Tripathi 44, Gagandeep Singh lbw Pandey 16, Vineet Sharma b Mishra 4, Rajesh Sharma not out 6. Bowling: A W Zaidi 29-8-84-5, Ratnesh Mishra 13-3-28-1, Mritunjay Tripathi 14.1-4-33-2, Parvinder Singh 2-1-6-0, Mohammad Saif 1-0-9-0, Nikhil Chopra 5-2-13-0, Gyanendra Pandey 9-3-19-1. Uttar Pradesh (1st innings): Rohit Parkash batting 28, Jyoti Yadav batting 6. Bowling: Gagandeep Singh 6.1-2-14-0, Amit Uniyal 5-0-15-0, Rajesh Sharma 1-0-9-0. However, Mishra bowled his heart out claiming six wickets in the 29 overs which he bowled. Bihar’s captain was out cheaply scoring just three while middle order just found no answer to Mishra’s attack. At one time Bihar had reached 153 for the loss of four wickets, but rest of the team collapsed, adding only 73 runs. Two of the tailend batsmen went without scoring and the last three wickets were lost at the score of 225 without a run being added. Replying to the modest total, Haryana had scored 23 without loss when the first day’s play ended. Bihar (1st innings): Nikhilesh Rajan lbw Amit Mishra 14, MS Dhoni c Chetan Sharma b Amit Mishra 85, Tariqur Rehman c Dharmender b Joginder Sharma 26, Rajiv Kumar st Dharmender b Gaurav Vashist 3, Aamir Hasumi c Chetan Sharma b Amit Mishra 31, Manish Kumar c Dharmender b Sumit Narwal 21, Anand Kumar lbw Amit Mishra 6, Sumit Panda c Sumit Narwal b Amit Mishra 19, Mihir Diwakar st Dharmender B Amit Mishra 6, Shahid Khan lbw Joginder Sharma 0, SB Chaubey not out 0. Extra (b-4,lb-9,nb-1) 14. Total (all out 78.2 overs) 225. Fall of wickets: 1/100,2/105,3/121,4/153,5/177,6/187,7/205,8/225 9/225. Bowling: Joginder Sharma 17.2-4-53-2, Sumit Narwal 9-4-20-1 Amit Mishra 29-9-86-6 Gaurav Vashist 23-6-53-1. New Delhi: Brilliant all-round performance by medium-pacer Sayyed Shahbuddin kept Andhra Pradesh afloat as they restricted Delhi to 59 for five after being bowled out for a meagre 198 on the opening day of their match at the Ferozshah Kotla ground here. Shahbuddin struk a career-best 71 to lend some respectability to the Andhra total but it was his four-wicket burst that allowed the visitors to fight their way back into the game. His four for 16 in a eight-over spell overshadowed the six-wicket haul by Delhi medium pacer Amit Bhandari, which put Delhi in the driver’s seat before tea. The lanky Shahbuddin wrecked the strong Delhi batting line-up reducing them to 23 for four in 8.2 overs. A 27-run partnership between Mithun Manhas (27 not out) and captain Vijay Dahiya (12) for the fifth wicket tried to bring the Delhi batting on track, before the latter was caught at second slip by Y Venugopal Rao off R V C H Prasad. Once Haryana gained the all-important first innings lead, the match had only academic interest left in it and both the teams went through the motions on the last day. For Haryana, yet another line batting performance came from Mahesh Ravat (116) who completed a well deserved century. Orissa (2nd innings): 195 for 5 (Arun Nayak 61, Haladhar Dass 20, Aparajeet Singh 2 for 50, Manvinder Bisla 1 for 11, Sachin Rana 1 for 19). In contrasting semifinals today, Punjab, helped by a brace of goals by strikers Guruvinder Paul Singh and Surjit singh, thrashed a listless Services 4-0 after leading by three goals at half time, while Bengal squeaked past a fighting Tamil nadu through a solitary second half goal by medio Supratik Aind. Tamil Nadu and Bengal will meet each other on December 21 for the bronze. Playing true to the tag of reigning champions, Punjab outplayed the Army men. Punjab, comprising reserve players from the BSF and the Punjab Police, looked a transformed lot when compared to their performance in the league match where they just manged to beat hosts Andhra Pradesh by a solitary goal to enter the semifinals. A three-goal blitz in a space of five minutes snuffed the fight out of the Army men who did not recover from the setback. Guruvinderpaul Singh gave the lead in the 36th minute with a quick finish and striker Surjit Singh struck twice in a space of three minutes as Punjab raced to a 3-0 lead. Surjit Singh first headed past Services custodian Malai Paul off a floater from the right and enhanced the lead with a similar effort, this time the cross came from the left. After the breather, Punjab made it 4-0 in the 79th minute when Guruvinder Paul Singh capped in a fine solo effort with a blistering 35 yard right footer for his second goal of the match. Bengal rode on a Supratik Aind strike to edge past Tamil Nadu 1-0 and enter the final. Dominating for most part of the semifinal outing at the Lal Bahadur Shastri Stadium, Bengal struck the winner in the 76th minute following a combined move from the left. 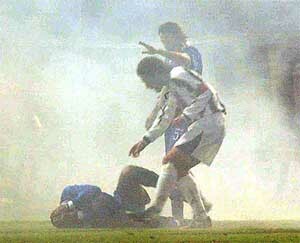 Striker Syed Rahim Nabi’s volley rebounded off Tamil Nadu custodian Douglas Ponraj’s hands before Pradip Indu’s second sortie came off the goalkeeper’s body. An unmarked Aind, who replaced Amar Pyne in the 65th minute, then put the ball in from top of the six-yard box to ensure Bengal’s passage into the final after the side’s consecutive ouster from the group stages in the two previous editions of the Games in Imphal and Punjab. Deepali Desphande of Maharashtra and Shweta Chaudhary of Harayana shot individual gold medals in the shooting event in the 32nd National Games at the shooting range in the Central University on the outskirts of the city today. While Deepali Deshpande clinched the gold in a hotly contested encounter in 50-m rifle prone, Shewta was the winner in the 10-m pistol. Deepali Deshpande and Sindhu of Kerala were tied at 588 at the end of the event with Lakshmipriya settling for the bronze. However, Deepali was declared the winner as she had a superb 99 in the final round while Sindhu was two points less. Deepali, joining hands with Anuja Tere and Suma Shiroor, spurred Maharashtra to a team gold in the same event with a total of 1745. The disappointment for hosts continued at the range as their imports — internationals Anjali Bhagwat and Kuheli Gangulee and Leena Shirodkar — could not pip Maharashtra and to be content with silver with a total of 1742. Madhya Pradesh picked bronze. In the 10-m pistol event, Shweta totalled 469.7 and was followed by Shilpi Singh of Andhra Pradesh (466.9) and Sushma Rana of Andhra Pradesh (466.8). In the first semifinal at the Lal Bhadur Shastri stadium, Manipur rode on a double strike by the fleet-footed Geetarani Devi to open up a 2-0 lead at half time, and added two more in the later session through Shanti Devi and Tababi Devi to put the issue beyond the hosts. The other semifinal encounter saw Pinky Bompal Magar put Orissa ahead, before Bengal put up a spirited second half display to turn the table on their rival. For the winners, Rinku Ghosh scored a brace, while Shanta Dhara chipped in with a solitary strike. Manipur and Bengal will now clash for the title on December 21, at the same stadium, in a repeat of the final in the Imphal games in 1999. Andhra Pradesh and Orissa will fight it out for the bronze on the same day. Despite having eight former Bengal players in their ranks, Andhra Pradesh lasses proved no match for the Manipur girls, who held complete sway and drew first blood in the sixth minute when Geetarani Devi scored off a Rani Devi midfield through. Geetarani scored her second goal in the 37th minute with a fine placing after skipper Bem Bem Devi ran a solo and essayed a fine square pass. Both the races were reduced by 10 km due to paucity of time. Punjab’s Hitraj Singh, Sarabjit Singh, Sukhjinder Singh and Gurpreet Singh were off to a flying start and took a commendable lead before covering the 60km distance in 1hr 21min 41.350 secs for the gold. Andhra’s foursome (1:22.00962 secs) won the silver and the bronze went to Services (1:22.23.560 secs). The women’s 60km mass start event saw Andhra Pradesh survive a protest by Manipur team management. 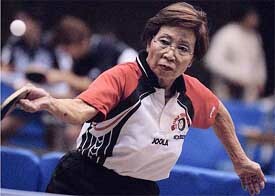 The protest was against the second placed Premlata V. Surban who was accused of wearing the chest number during the race. After the technical officials confirmed that the chest number of the cyclist was checked and found correct before commencement of the event, the jury of appeal over-ruled the objection. However, the event itself generated great interest as the top three cyclists were going neck and neck. Close to the finish line, Manipur’s O Binakumari surged ahead and just 0.003 secs separated Binakumari (1:55.38.190 seecs) and Premlata V. Surban (1:55.38.193 secs). The fifth and final day of the showpiece track and field event also saw Madhuri A. Singh of Punjab capping a golden double by adding 800 metre title to her 1500 metre win earlier. Five games record were re-written today in 800m men, three relay events — 4x100 men and women and 4x400 women - and women’s javelin throw. Lamba, who had won a gold in the individual show jumping event yesterday, logged 61.30 penalty points (pp) riding Tipsy for a gold. He was followed by Gulab Singh on Nurshi (73.73 pp) and Sunil Kumar on Morelyn (77.78 pp), both of Services. Haryana won all its four matches to total eight points and take gold in the championship. Punjab won three matches to accrue six points and Chandigarh with only two wins totalled four points. While defending champions Punjab & Sind Bank moved one step ahead to be in the final by defeating Railway XI Ferozpore 2-0 , Border Security Force defeated Punjab Police 2-1 in 6th Ramesh Chander Memorial Hockey Tournament being played at Olympian Surjit Memorial Hockey Stadium here today. In women’s section, Ludhiana XI defeated Sports Wing, Badal 1-0 and in Boy’s section Ropar Hawks defeated PAP Academy 2-1, and Escorts Ramesh Chander Memorial Academy (ECMRA) drew with Punjab & Sind Bank Academy (PSB-A) 1-1. P&SB started raiding Rly XI goalpost from the start of the game. In the 18th minute Sandeep Singh and Mandeep Singh made a beautiful move from the right flank and in the circle J. Tirkey of Rly XI stopped the ball in front of goal-post with foot and umpire had no hesitation in awarding a penalty stroke in favour of PSB Rajvinder was not able to convert it. In the 19th minute, Rajvinder Singh of PSB scored a field goal to give its team 1-0 lead. At lemon break score was 1-0 in favour of PSB. After the breather, there were many attacks and counter attacks from both sides but in the 67th minute again Rajvinder of PSB scored a field goal to further increase lead for his team (2-0). At the final whistle score was 2-0 in favour of P&SB. In another match international Harbhajan Singh of BSF scored a field goal to open account through a field goal (1-0). Punjab Police got two penalty corners in the first half but was not able to convert. At the lemon break BSF were leading by 1-0. After the breather, BSF got three penalty corners in a row in the 42nd, 43rd and 44th minutes, but they all went waste. Brinder Guria of BSF further consolidated lead for his team in the 46th minute through a field goal (2-0). In the 65th minute Kulbir Singh of Punjab Police scored with a powerful shot (1-2). At the final hooter score was 2-1 in favour of BSF. In the women’s section, Ludhiana XI’s Kamaljit Kaur got a pass from Harpreet Kaur near the circle and sent ball straight in the box (1-0). Sports Wing, Badal, girls tried their level but their efforts proved futile as Ludhiana XI won the game 1-0. Local favourites Indian Bank made costly errors and gifted their strong opponents Salgaocar, Goa, a 2-4 victory today, with Dudu Omagbemi notching up a hat-trick in the National Football League here. The teams were tied 1-1 in an explosive start that deceptively suggested a neck-and-neck encounter in the offing, before the hefty 19-year-old Nigerian hit overdrive, scoring in the 20th, 25th and 84th minute. With this win, Salgaocar raised their points tally to ten, putting them in position for a strong finish in the first division of the championship. Mr B.S. Bodhi, who was working as District Sports Officer, Jalandhar, died yesterday following a massive heart attack. His untimely death was mourned by the officers of the Sports Department, Punjab, today. The Director Sports, Punjab, Mr Kartar Singh, who is at Hyderabad in connection with the National Games, has expressed deep sorrow over the sudden demise of Mr Bodhi, who joined the Sports Department as Sports Officer in 1976. He was instrumental in coaching a large number of hockey players. A condolence meeting was held today by the Punjab contingent participating in the National Games at Hyderabad where rich tributes were paid to Mr Bodhi. Lauding his contribution to hockey, Mr R. S. Gill and Olympian Pargat Singh said in his death Indian hockey had been rendered poorer. It may be recalled that Mr Bodhi was on his way to New Delhi with his son when he breathed his last in his car following a heart attack yesterday. Aita Ram, a member of the St. Stephen’s Football Academy, has been selected in the under-14 Indian team that left for Kathmandu today to participate in SAARC Asian Football Championship from December 20 to 27. India, Bangladesh, Nepal, Sri Lanka, the Maldivies, Bhutan and Pakistan are participating in the championship. The two top teams will participate in the Asian Football (U-14) Championship. Aita Ram attended a camp for the tournament at the Tata Football Academy, Jamshedpur in November.